I’ve seen plenty of recipes and pins around the web for “pancakes” made with just eggs and bananas. I’ve tried this. It’s not bad. I’ve also tried “pancakes” that are eggs and oatmeal. Also not bad. But I don’t want not bad. I want good! I want delicious! I want to feel like I’m really eating a pancake darn it! I’ve decided to combine the two ideas with a few other extra additions for a healthy version of a pancake that is super fast to whip up and healthy for the whole family. This version resembles more of a pancake to me. My little man gobbled them up with the addition of a few blueberries and some maple syrup. Sliced almonds and a drizzle of honey for me and it was a great sweet and healthy way to start the day. 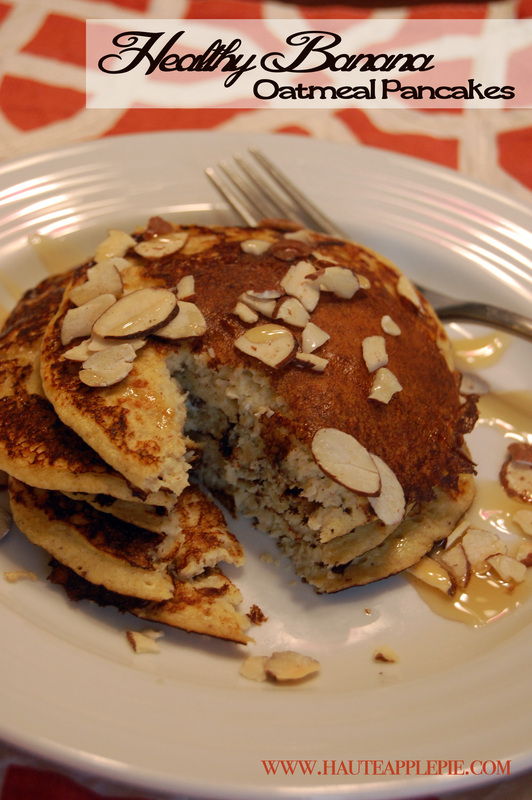 Healthy Banana Oatmeal Pancakes Makes 10-12 3 eggs 1/2 cup old-fashioned oats 1/4 plain non-fat Greek yogurt 1 ripe banana 1 tsp cinnamon 1/2 tsp vanilla Honey and sliced almonds if desired Preheat a skillet. Add all ingredients (minus honey and almonds) to a blend or food processor. Blend until smooth. Grease skillet and pour batter into circles. Flip when top becomes bubbly. Cook for another minute or two – until cooked all the way through. Remove from skillet. Drizzle with honey and top with sliced almonds. Enjoy! Here are some more great pancake recipes from around the web with our friends from Food Network!